At Corona Coatings Corp., we have been applying our polyurethane spray foam insulation expertise to insulating residential and commercial storage tanks since 1976. 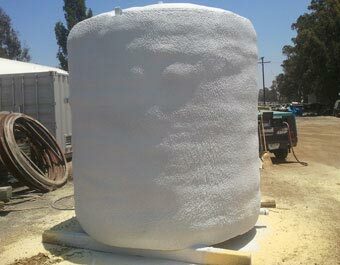 Polyurethane spray foam insulation is extremely durable, and is ideally suited for insulating commercial and residential storage tanks of all types, including water-holding tanks, grease traps, wine tanks, solar tanks, and chemical tanks. Polyurethane spray foam insulation is a time-tested, proven solution for maintaining even temperatures and reducing the energy costs associated with the heating and cooling of storage tanks. It has the highest R-value of any insulation method available on the market, and has the ability to adhere tenaciously to the surfaces of storage tanks, filling in any cracks and seams, and creating a weather-tight thermal barrier between the tank and the elements outside. In addition, it also increases the structural integrity of the storage tank, and provides a seamless protective envelope around the tank which provides a highly effective vapor and moisture condensation barrier. Moreover, polyurethane foam insulation protects storage tanks against the damaging effects of rust and corrosion, thereby prolonging their lifespans. At Corona Coatings Corp., we have provided our tank insulation services to homes, businesses and municipalities throughout Riverside and San Bernardino, and have performed tank insulation projects for homeowners; businesses such as restaurants and hotels; countless industrial clients; and also numerous municipal clients, including the City of Riverside. And because customer satisfaction is extremely important to us, our knowledgeable spray foam installation technicians work closely with our valued residential and commercial clients to ensure that their tank insulation project is performed to their exact specifications. In addition, because foam insulation adds inches to the diameter of storage tanks, our technicians always replace our clients' storage tank fittings as necessary following foam insulation application, in order to accommodate the increased dimensions of the tank. Call us today. We offer free onsite estimates on all tank insulation projects, and accept all major credit cards. Corona Coatings Corp. is licensed and insured.